Chesapeake AED Services in Baltimore’s premier CPR training and certification facility, offering comprehensive training courses designed to teach people lifesaving techniques. We also offer a wide range of information for Automatic External Defibrillators, essential life saving tools that many buildings keep on hand in the event of a medical emergency. Our CPR certification and training programs are top rated and we take immense pride in providing a teaching environment that shows people the right way to help save lives. Join us today – call for more information or fill out the form below to get more details on CPR classes, AED sales, and much more. 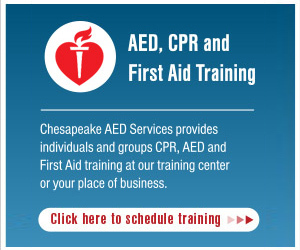 CPR Training: Chesapeake AED Services offers a suite of CPR training courses in affiliation with the American Heart Association. We have several different courses and training programs with certification and renewals for CPR, AED, or First Aid training. Different classes offer a range of skills and disciplines and our schedules are flexible! Online CPR Courses: Online courses are available for CPR training as well as AHA. AED Services: We offer information on Automatic External Defibrillators, both for sales and training purposes. Our team can help you decide which AED device is right for your group and the training needed to use these important machines correctly. Chesapeake AED Services is located on Back River Neck Road in Baltimore. We are located directly off Baltimore Beltway I695, Exit 36, Route 702. We are also a short drive from Interstate 95.